Jimmy Carter the Poster Child of Execution? I was with Sam over on his Go Big Always blog on what it takes to go big right up until he made Jimmy Carter the poster child of great execution. Yes, Carter has built a lot of houses, but he sure didn’t accomplish much during his Presidency. If you need a political figure, how about Gandhi or someone that really changed the world by executing? Who should the Einstein of great execution be? Demming? Not a recognizable face. If You Had the Opportunity to Steal, And Someone Stole, Are You Guilty? That’s essentially the case the RIAA brought against Jammie Thomas. Because she listed 24 copyrighted titles on a peer-to-peer network, and because the judge issued an order to the jury that they did not need any proof that anyone downloaded those titles, she lost her original trial to the tune of a $222,000 penalty. I recognize this is a Civil and not a Criminal case, yet it still seems wrong under our system to convict on that basis. The RIAA argues its impossible to tell with these systems how exactly the theft is going down, but that does not seem to me a reason to waive the rights of the defendant. My view of our system has always been that we adopted a fundamental principle that it is better for many guilty men to go free than it is to convict a single innocent. The system is intentionally designed to overwhelmingly favor the defendant, even though it means many of the guilty go free. That’s okay, because we’re a nation that favors individual rights. The Home of the Free. There are many areas of our legal system that have escaped this simple principle. Patent litigation egregiously favors the plaintiff. When I was involved with a recent Patent Troll case, I was told by our counsel that it would cost us $1M to get to the first court room appearance if we fought it. I asked what it would cost the plaintiff and was told, “about $150K.” There is an asymmetry for you! Counsel went on to advise us that proving a patent was invalid, whether because it was overly broad or that there was prior art, was prohibitively expensive. They estimated the defendant could spend upwards of $4 million on that task and still might not be successful. Because of that, their counsel was that to fight a patent at all would generally require one to demonstrate that what they were doing did not infringe the patent in any way as it was drafted. That’s nearly impossible too with the junk patents that are out there these days. So the trolls get paid. There are public companies that make their business on nothing but this sort of practice. It has gotten so lucrative that individuals once engaged in creating intellectual property are increasingly being lured into the business. Nathan Myhrvold’s Intellectual Ventures owns 20,000 patents and has so far returned over a billion dollars to investors. This sort of thing is much more damaging to innovation and IP rights than anything the RIAA is up to. If you agree with the sentiment here, be sure your representatives in Washington know that you DO NOT supoort the Enforcement of Intellectual Property Rights Act of 2008 (EIPRA). That ridiculous piece of proposed legislation would force the DOJ to sue both criminally and civally against private individuals on behalf of the RIAA and others, and then give the proceeds to the RIAA and others. In short, it makes the DOJ a pro bono lawyer paid for by you the taxpayer to act against you the taxpayer. Ars Technica has more on this. ReadWrite Web on the matter. Mathew Ingram notes that the judge also implores Congress to reduce what he sees as egregious penalties. He sees a $200K plus penalty as out of line with sharing just 24 titles. Does Agile Development Work for Sytems Integration? The gang of Enterprise Irregulars are currently wondering whether Agile can work for implementing Enterprise Software. By implementation, I mean installation and integration of a complex package such as an SAP or Oracle ERP system. It’s an interesting question. I thing it could work, and work well in theory, but I think there are a number of factors that would make it extremely difficult to do in practice. First, let me say I’m a fervent believer in Agile software development, and helped contribute some of its fundamental underpinnings early in my career. One of the seminal papers behind the early Agile movement was a study done on one of my development groups that found productivity was off the charts. With that said, Agile is not for everyone or every project. There are some requirements for it to be successful that fly in the face of a lot of the established norms for IT projects and implementations. That’s not to say you couldn’t use Agile for such projects, but unless everyone involved clearly understood the Agile requirements, it would not likely be an unsuccessful attempt. First, Agile is the opposite of a boil-the-ocean project. It recognizes that you shouldn’t even try to do everything in one release. It argues for many small evolutionary releases, or if not releases, at least milestones where things are stabilized and accepted as complete before moving on. In some cases overly ambitious goals that can only be met in a single humongous milestone are rejected. Second, Agile recognizes that it is often folly to completely specify a system before writing any code. As such, it seeks to be iterative, to get something built, to get feedback on that checkpoint, and then to iterate until the feedback is acceptably positive. This requirement is particularly at odds with the normal desire on both sides to manage risk (apparently) by documenting everything in incredible detail before much gets done. In my mind there is a false sense of security in long SOW’s and other documents that is no substitute for signing of small subsystems that you can actually use, test, and demonstrate are working. But, this is what the world grew up on and is used to. In many ways, Agile has a risk profile more similar to SaaS. Consider a huge up front investment in specification to be the equivalent of paying an On-premises license fee up front. Neither the spec nor the license are worth much until some software is written and working. Lastly, Agile is not well suited to extremely large groups and it eschews heavy process quite on purpose. It’s important to note that it does this not to enhance creativity as Vinnie fears, but precisely to enhance productivity. It recognizes (as is called out in the Coplien paper I link to above) that the primary productivity bottleneck in software development is communication. The Mythical Man Month issue is the more people, the harder it is to keep them in sync. If our bench is limited, we perforce select the best possible players to be on the team. This again, is sharply at odds with the typical SI practice of having very few talented players and lots of grunts. The talented players often move around constantly fire fighting. An Agile approach favors using only the most talented players on small teams. Clearly this interferes with the economics of most SI’s who want to bill as many hours as possible using labor that is as cheap as possible. I read with interest Louis Gray’s post about iTunes 8’s new “Genius” feature. It’s designed to enable to help you find new music similar to songs you already like based on what other people liked. It’s much the same as Pandora, which a co-worker jokingly refers to as the search engine for songs that gives you anything but the song you asked for. This ability to make recommendations for you based on your preferences and those of others is basic merchandising functionality, but one could argue it can make a good franchise great. Amazon benefited hugely from being an early innovator in online merchandising. To this day their site continues to have some of the best options along these lines of anyone. Another great example is Netflix. They give you suggestions for new movies to rent based on your ratings of moviies you liked. This stuff works amazingly well. I think of it as helping to make the Long Tail mainstream. Who isn’t delighted to discover a new song, movie, or other product that is a surprisingly good fit for their tastes but that they hadn’t found on their own? What can your web site or service do that’s along the same lines? How Hard Could Syncing Calendars and Contacts Be? Recently I wanted to sync up my calendar and contact info between my home and work instances of Outlook. In fact, I was slightly more ambitious. I thought this could be a good stepping stone towards moving off Outlook altogether if I could get everything sync’d to appropriate Internet cloud applications. Little did I know! I started with Google Calendar Sync, because, “Hey, it’s Google!” I did this leg at work and it appeared to be perfect that first time. I got home installed it on the home PC, and low and behold about 60% of the appointments didn’t go through. Doh! I could see them get created and then almost immediately deleted. It seemed like the more complex an appointment was (e.g. recurring, with a long note attached, with attendees, or whatever), the more likely it wouldn’t come through. I tried all the troubleshooting suggestions and then went into Google Groups to see if their community had anything going. What a mess! Lots of people just blasting out their problem. Most of them didn’t seem to be getting any response. Very little rhyme or reason. I must’ve found 5 or 6 recent posts with the same problem as me. None of them had any answers. Clearly it was a common problem. Does everything at Google get done in people’s 20% time? I can’t imagine shipping a bug like this and just leaving it. To make matters worse, Google syncs the calendar, but not the contacts, even though Gmail has contacts. You’ll need another solution for that. I reluctantly exported the Outlook and was resigning myself to exclusively using GMail for contacts. At least iTunes synced the contacts from Google perfectly. This is a blessing because there are a very limited number of places the iPhone could sync to with iTunes on my PC. Guess I shoulda bought a Mac, eh? When I got back in to work and found even my work Google Calendar Sync could no longer do the right thing, I uninstalled and went looking for the next thing. I also resolved that if I couldn’t use Google Calendar, I didn’t particularly want to leave my Contacts in GMail either. I prefer one-stop shopping for these simple chores. 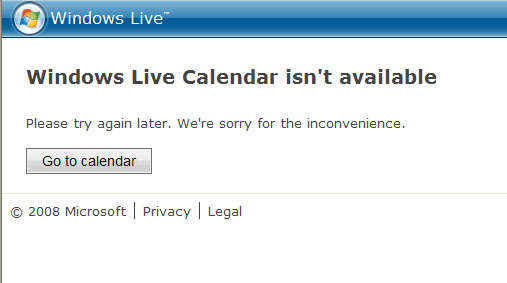 I got the bright idea that since I was syncing two Outlooks perhaps I should look at Microsoft Live. If anyone could sync two Outlooks, it ought to be Microsoft, right? Wrong! Excellent! The only thing worse than unreliable desktop software is unreliable cloud software. I tried both in the morning and this evening as I write this. No joy! Onward, there are many more syncing options to try. I downloaded two other programs from small startups. One didn’t work at all. One sort of worked. I only synced for 3 days (nice to have the option not to do it all) and it appeared to duplicate appointments the first time. I tried again and there were no more duplicates. This was kind of okay, but I worried about the dupes and they were going to charge me about $30. There was a sojourn through Yahoo Mail and Zimbra, because a co-worker used Yahoo and pointed out iPhone could sync to it and because I’ve always admired the Zimbra apps. But somehow, it just didn’t seem easy, so I didn’t even finish trying out Yahoo. Plus, you never know where that crazy company will wind up these days. “Let’s try one more,” sez I. So I tried Plaxo because I read somewhere that it works pretty well for this. Low and behold, it worked perfectly, both at home and at work. My Outlook calendars and contacts are perfectly synced now. I can view them online in Plaxo if need be. I’m a little uneasy that this isn’t really what Plaxo is meant for (I see it more as a LinkedIn competitor), but what the heck, it works! Now why couldn’t all these others get their stuff to work? This shouldn’t be that hard. My very first stop, Google, should have worked, worked well, and handled contacts. I should never have even needed to try all the rest. And what does this say if I do want to abandon Outlook altogether? Some would say it makes it easier just not to worry about sync, but I need to take my data with me when I drop of Outlook at the wrecking yard so that won’t work. Oh well, onward. Today’s primary problem, syncing, is taken care of. Tomorrow I’ll worry about web apps. It’s no wonder Microsoft still sells a ton of Office! 10 a.m. Steve Jobs takes the stage in his signature outfit. He looks good and jokes as the screen comes up with the message: “Reports of my death are greatly exaggerated.” Big applause. Seems Wifi is nonexistant and nobody can get online. How do they do the show without network connectivity? Must be some for the presenters at least?